The Colleton County Sheriff’s Office received wind of Navaeh’s request to read her handwritten letter aloud apologizing to Colleton County deputies, officers from the Walterboro Police Department and members of the community who spent numerous man hours searching for her after a run-away incident she initiated, that occurred a few weeks prior. Honoring Navaeh’s request they contacted her and invited her to the office to fulfill her wishes. Navaeh stood in front of officers reading her handwritten letter apologizing for her actions, letting the community and all authorities involved know that she was sincerely sorry for causing everyone such grief and worry by her actions that took place that day. Despite the situation, Navaeh was truly thankful for everyone’s concerns and social media shares which helped lead to her recovery. Because of this incident, it has brought Navaeh closer to her parents, authorities and the community; since then she has been able to view things in a more positive light. 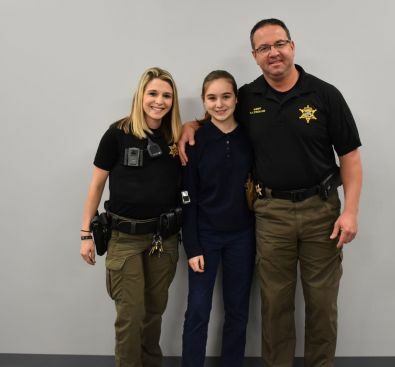 While at the sheriff’s office Navaeh had the pleasure of having one on one meet and greets with each officer who was involved with bringing her to safety including Sheriff R.A Strickland. Since then she has been able to gain a little more knowledge of who the officers are by getting to know them on a personal level. Since this incident occurred the Colleton County Sheriff’s Office has taken Navaeh under their wings to offer guidance on the right path by attending; church services with her in the community, making Navaeh a part of the Colleton County Sheriff’s Office team for the annual “Lowcountry Regional Cleanup Day” and by taking Navaeh out to lunch where they can have conversations regarding everyday life and how she’s improving on a day-to-day basis. “Children make mistakes, sometimes they’re big mistakes. Navaeh has taken this negative experience and turned it into something positive for herself and the community by recognizing her faults and facing them, and for that, she will continue to grow and become a better person. We look forward to spending all the time we can with Navaeh continuing to make a positive impact on her life.” Said, Sheriff Strickland.